Importing client data into CRM begins with proper preparation. If your data is in a CSV format, check out these tips for preparing a CSV file. After the file is properly prepared, log into ESP Web. Then, click on the CRM tab. In the CRM section, click on the Import button. The first step to select the type of file you would like to import. If you are working with a CSV, Outlook or Google file, choose whether you are importing Companies or Contacts. If your data file contains both company and contact information, select Companies. Then, click on the Choose File button to browse your computer for the data file you want to import. If you are working with an IIF or vCard file, you can click on the Choose File button to browse your computer for the data file you want to import. Locate the file on your computer, select it and then click on Open. The file will upload and all columns will be available for mapping. 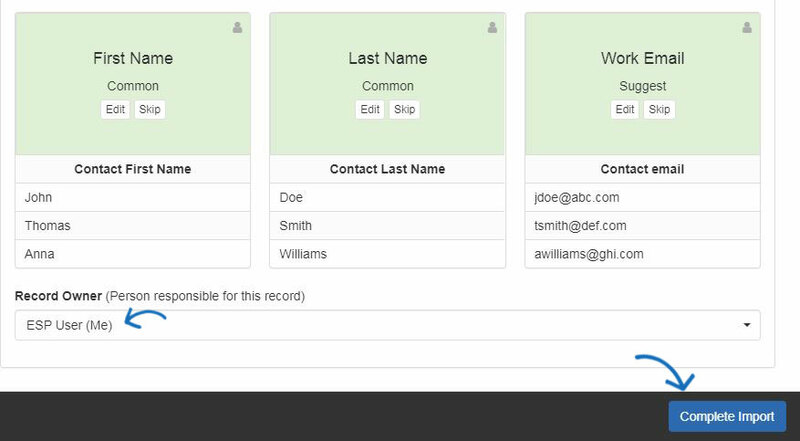 Each column from the data file will need to be mapped to a location within CRM. Fields that have been automatically mapped will display with a green background. 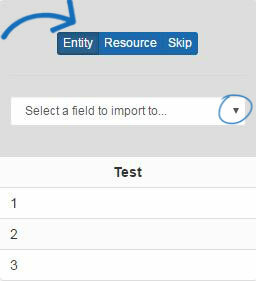 To change the field to which the column has been mapped, click on the Edit button and then use the Entity and Resource options to select a field. An entity is a general field, such as company address or contact first name. A resource is a more specific field, such as a Company Email or Contact Tag. Columns which have not been automatically mapped will display with a gray background with a blue toolbar for mapping. Suggestions will display with clickable field options. Click on an option to map the column to that field. After all of the fields have been mapped, click on the Complete Import button. Once all of the information has been imported, you will see a pop-up notification in the lower right corner of your screen.